I have a few cabinet makers in my life who will cringe at this post. 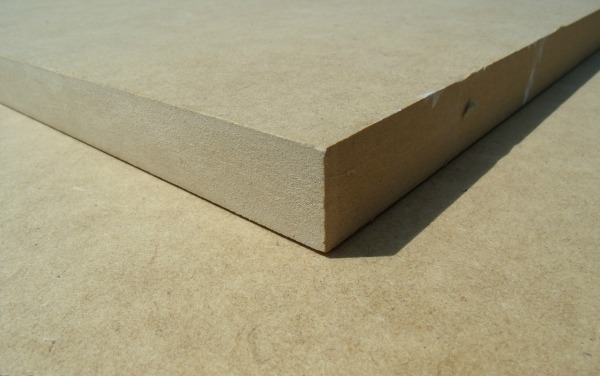 There is a lot to hate about MDF - it is not really wood - Medium-Density Fibreboard is basically what fell off real wood, pressed together with glue. It has no grain or personality, it is messy to cut up (the dustiest sawdust you ever saw) and you pretty much have to paint it. But where wood purists see an arboreal abomination, I see a great starting point for the modern, basement craftsmen, looking to develop some semblance of skill. Despite having a father who can frame a house and build lots of stuff out of wood, a father-in-law who has a wood shop and could rightly be called a bona fide cabinet maker and a good friend who makes legitimate wood-art (that even Ron Swanson has commented on) I really have trouble making stuff out of wood. For a long time, I blamed my building challenges on how much I rushed projects, how little I thought things out and my limited work space for my inability to do something nice. I don't need to do something nice. I need to mess around a bit - make mistakes (not, "Oops, there goes my thumb" mistakes, but, "Oops, I just ruined that piece of wood with one dumb cut") and learn. I also needed the cheapo budget that affords experimentation and mistake making. Home Depot has it in "Handi-Panel" sizes - these fit in most minivans or hatchbacks. No delivery fees! It cuts easy with a circular saw or jigsaw. Messy as anything, yes - but when your skill set is developing, you want something that cuts easy, so you can focus on cutting a straight line (and not your fingers). It assembles well with screws, nails and glue. You will need to pre-drill any holes because it will split, but that is the price you pay for learning with faux wood. Once assembled, it is strong. The price is right (this ain't maple - or even pine) so you can screw up and not break the bank. When done, sand, prime and paint and you have something to behold. 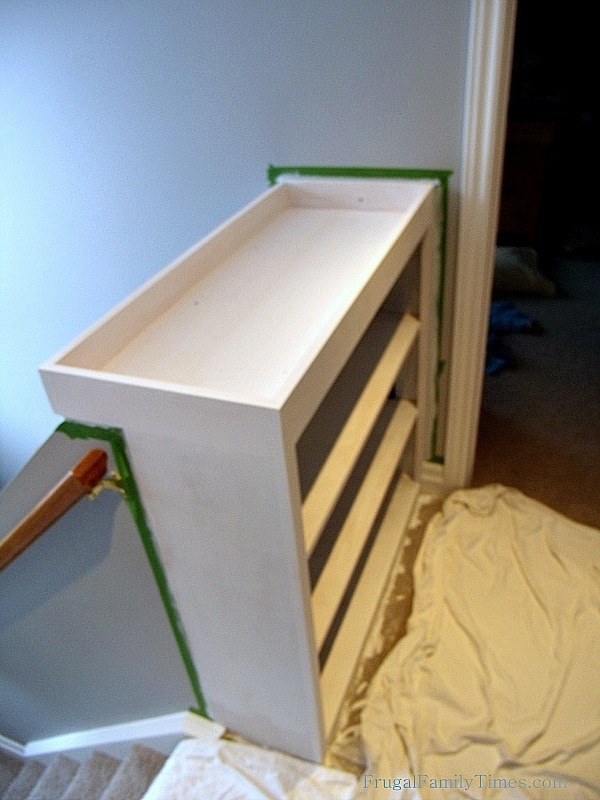 MDF will always be painted, so be OK with filling holes, pencil marking it up and otherwise making mistakes. Paint covers all. The first was about 20 minutes in the workshop with leftover pieces from our bathroom reno. 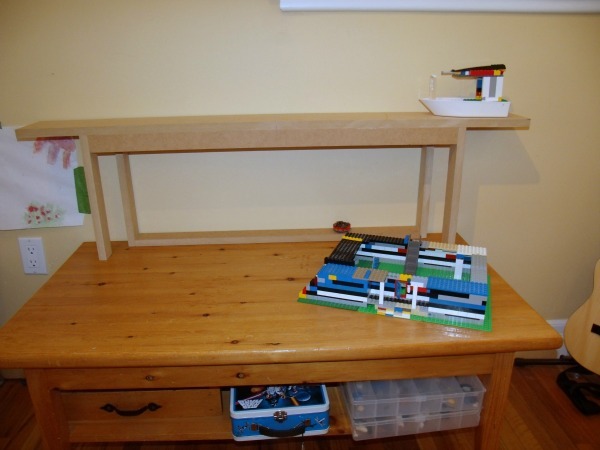 I wanted a narrow shelf for the kids to put finished Lego models on. Because it is MDF, the kids can write on it, paint little landing platforms, gardens or whatever and who cares? Not me, because it is "wood" I planned on chucking anyway. Top of the Stairs Plant-Bookshelf. For a full tutorial on how to build this, click here. This Second project was more involved but still MDF based. We did it about a year and a half ago when we decided we needed a shelf for books and plants in an unused spot upstairs. It was the first such project we tackled on our own - without the guidance of one of our handy-mentors. What gave me the courage to go along with Robin's ambitious plant-bookshelf plan? My good friend MDF. 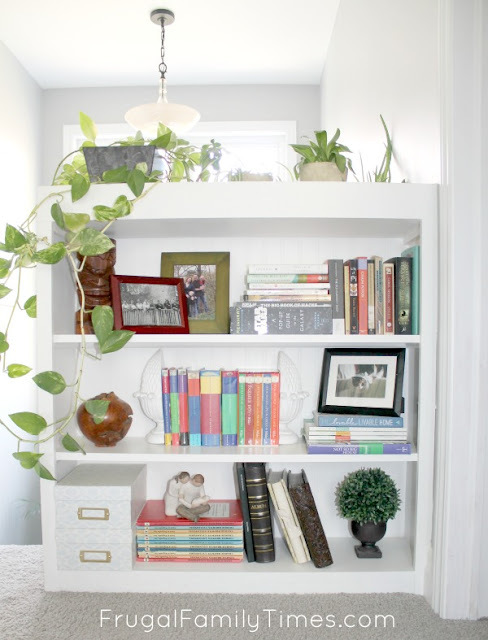 Here's the full tutorial for our bookcase-plant stand. So if you were a little kid who used to cut up cereal boxes and tape them together to make stuff but let those skills stagnate as you grew up, I encourage you to get acquainted with Medium-Density Fibreboard the next time you feel creative. Even if you mess it up, you'll learn something and it won't cost much. And did I mention you can paint it and no one will ever know? Have you built something with MDF? How'd it work for you? Hi there! Thanks for this. I drew up some plans to make my kid a little play kitchen set and planning on mdf or as they call it here 'supawood' and since I've never used it before, thought to get some tips before I decide on it. We were going for 9mm and nails n glue, but I see now that a hammer isn't gonna work so may have to get a thicker piece n do screws. Thanks again!